On the 16th (Thu), enjoy breathtaking views from Space Needle and then explore the world behind art at Chihuly Garden and Glass. Get ready for a full day of sightseeing on the 17th (Fri): admire the masterpieces at Seattle Art Museum, wander the streets of Pike Place Market, then stroll through Kerry Park, and finally admire the striking features of Seattle Public Library. To find ratings, traveler tips, other places to visit, and more tourist information, read Seattle driving holiday planner . Fort Lauderdale to Seattle is an approximately 8.5-hour flight. You can also do a combination of train and flight; or drive. Traveling from Fort Lauderdale to Seattle, you'll gain 3 hours due to the time zone difference. Traveling from Fort Lauderdale in May, expect nights in Seattle to be colder, around 52°F, while days are a bit cooler, around 68°F. 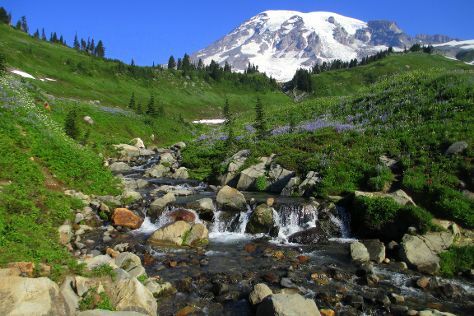 Wrap up your sightseeing on the 18th (Sat) early enough to take a train to Mount Rainier National Park. The star attraction of Mt. Visiting Mount Rainier and Mt. Fremont Lookout Trail will get you outdoors. You'll discover tucked-away gems like Mount Adams Wilderness and Trail of the Shadows. The adventure continues: trek along Nisqually Vista Loop and stroll through Camp Muir Trail. To see more things to do, traveler tips, maps, and other tourist information, you can read our Mount Rainier National Park trip website . You can take a train from Seattle to Mount Rainier National Park in 2 hours. Alternatively, you can take a shuttle; or take a bus. Traveling from Seattle in May, expect slightly colder with lows of 46°F in Mount Rainier National Park. Finish up your sightseeing early on the 21st (Tue) so you can catcht the bus to Olympia. Olympia is the capital of the U.S. Get outdoors at Nisqually National Wildlife Refuge and Tumwater Falls Park. Do some cultural sightseeing at Mill Lane Winery and Childhood's End Gallery. When in Olympia, make a side trip to see Chambers Bay in University Place, approximately 36 minutes away. There's much more to do: identify plant and animal life at Woodard Bay Natural Resources Conservation Area, explore the activities along Tolmie State Park, appreciate the history behind Washington State Capitol, and admire all the interesting features of Nisqually Reach Nature Center. To see other places to visit, photos, traveler tips, and other tourist information, read Olympia road trip app . Take a bus from Mount Rainier National Park to Olympia in 2 hours. May in Olympia sees daily highs of 68°F and lows of 44°F at night. Wrap up your sightseeing on the 24th (Fri) to allow time to drive to Portland. Get outdoors at Ecola State Park and Cannon Beach. Get a sense of the local culture at Columbia River Maritime Museum and Seaside Inverted Experience. Go for a jaunt from Portland to Astoria to see Astoria Column about 2 hours away. Dedicate the 28th (Tue) to wine at some of the top wineries in the area. There's more to do: contemplate the long history of Pittock Mansion and identify plant and animal life at Audubon Society of Portland. For reviews, more things to do, where to stay, and other tourist information, read our Portland trip maker site . You can drive from Olympia to Portland in 2 hours. Alternatively, you can take a bus; or take a train. Plan for somewhat warmer nights when traveling from Olympia in May since evenings lows in Portland dip to 51°F. Wrap up your sightseeing on the 28th (Tue) early enough to travel to Newport Beach. City beaches line the coast from the Balboa Peninsula to the Santa Ana River in Newport Beach. Get outdoors at Dolphin & Whale Watching and Crystal Cove. Step off the beaten path and head to Wilson Creek Winery and Ricardo Breceda Gallery & Sculpture Garden. Explore the numerous day-trip ideas around Newport Beach: Carlsbad Village (in Carlsbad), Oceanside (Oceanside Museum of Art & Oceanside Pier) and San Clemente Pier (in San Clemente). And it doesn't end there: examine the collection at Mission San Juan Capistrano, kick back and relax at Newport Beach, identify plant and animal life at Pacific Marine Mammal Center, and take an in-depth tour of Balboa Island Museum & Historical Society. To find photos, where to stay, more things to do, and tourist information, use the Newport Beach holiday planning tool . You can fly from Portland to Newport Beach in 6 hours. Alternatively, you can do a combination of flight and bus; or drive. Traveling from Portland in May, plan for a bit warmer nights in Newport Beach, with lows around 60°F. On the 1st (Sat), wrap the sightseeing up by early afternoon so you can travel back home.